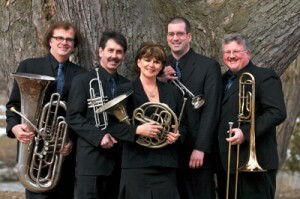 Home→Blog→brass quintet and organ→A Case for a New Ensemble: The Organ Sextet! A Case for a New Ensemble: The Organ Sextet! Brahms’ Horn Trio is a work for violin, French horn and piano, not a piece for three horns. Similarly, a Piano Quartet is not an aggregation of four pianos, it’s the combination of (or a composition for) violin, viola, cello and piano. 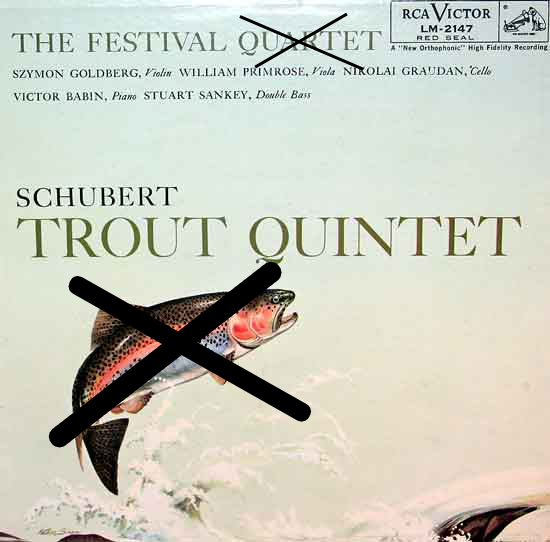 And the Schubert “Trout” Quintet is not a …well… never mind, I’m sure you get the idea! 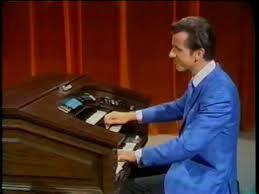 And so, in keeping with this tradition, I submit for your consideration — the Organ Sextet! With all of the many and varied 21st century distractions competing for people’s leisure time, today’s audiences are demanding much more from their live concert experiences, and to address the elephant in the room, watching an organ recital can, at times, be quite boring. Often, the audience can see only the side or the back of the organist’s head whilst in the act of performing, and if the organ happens to be built at the back of the church, one has to turn around in order to see, perhaps only to catch a glimpse of them emerging to take their bow. However, the apology must be made in the sense that this is quite understandable and even desirable. Organs were never supposed to be the main attraction in the Church, and would often be tucked away from view, in order to give their musical presence a sense of mystery and awe. But happily, some churches with organ concert series have acknowledged this predicament, and recent innovations have been the installation of moveable consoles and the use of cameras and projection screens to add that missing visual element, but it’s still not quite the same as being close to the action. Dum da-da deeeee! Enter, the brass quintet — a popular and well-known medium, due in a large part to the pioneering efforts of groups such as the Canadian Brass in North America, and the Philip Jones Brass in Europe. The visual impact, variety of repertoire, relaxed concert atmosphere and engaging stage manner of the modern brass quintet have made it an “easy sell” for concert presenters and to audiences around the world for over 30 years. 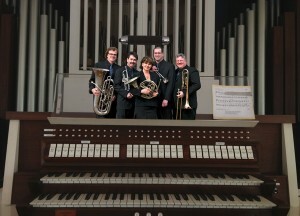 Organ + Brass Quintet = Organ Sextet! It should be noted that organists and brass quintets are certainly not strangers to one another, often finding themselves performing together on Easter and Christmas events, so there is already a receptive climate for forming this musical partnership, but before I go any further, allow me to make one thing very clear — this is not about the brass quintet coming to the rescue of the visually boring organ recital! 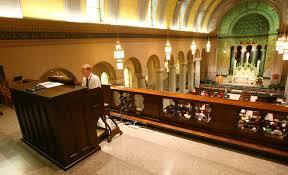 Well…okay, maybe just a bit, but consider the advantages of the addition of the organ to the brass quintet concert. A fine pipe organ often brings with it a visually attractive and acoustically resplendent performance venue, and musically, provides a respite from the relatively limited tonal palette of the brass quintet. Additionally, the organist can bestow a welcome and much needed rest upon the brass quintet’s collective embouchures with the judicious programming of solo organ works throughout the recital. But there’s a second elephant in the room — repertoire. Other than myriad works for trumpet and organ, there is not that much original music written for organ in combination with multiple brass. An internet search for “brass quintet and organ music” will show that there are a small number of original secular works for this combination, but the bulk of the available repertoire consists of arrangements of an (understandably) ecclesiastical nature. Back in the 1970s, very early on in my tuba playing career, I was faced with this exact problem. My brass quintet of the day had been asked to play a short feature with the organist who was performing on the same choir concert that we were. There was virtually nothing available. Fortunately, around this time I had been studying composition and had penned quite a number of Palestrina-like motet exercises for my classes in Renaissance counterpoint . In desperation, I selected three or four of the better ones and rescored them antiphonally for brass quintet and organ. In spite of sounding quite derivative, the piece came off rather well, and as a result of that first experience, I discovered the thrill of a brass quintet and an organ joining forces. Much later on, with the formation of True North Brass in 1997, more works followed, again, out of necessity. We found ourselves busy touring, and there would be occasions on some of our USA engagements, where we would perform full recitals in large churches and combine forces with the “house” organist for several selections. Works that I had originally conceived for brass quintet alone now became new (and often improved) versions with the addition of the pipe organ. And it was just a few years ago that I arranged Moussorgsky’s Pictures at an Exhibition for these forces and that was when I realized the full potential of this ensemble. Each, on its own can compete for being the loudest (or softest) sound in the performance space, (but to the brass players’ chagrin, the organist would win every time!). And the multitude of stops available on the organ has the ability to not only create a fantastic contrast to the brass quintet sound, but to provide new tonal colours and a wonderful homogeneous blend as well. It is truly an exciting combination! And so, to this end, I have created AUBADE MUSIC EDITIONS, a publishing company that specializes in original compositions and arrangements for brass and organ. There are already over 25 titles in the catalogue, including such diverse works as the aforementioned Pictures at an Exhibition, Debussy piano preludes, antiphonal works of Gabrieli, the bombastic 1812 Overture by Tschaikovsky, original compositions by me, and, of course, music for the Christmas and Easter seasons. Hopefully, this effort will aid the cause for the Organ Sextet (or Brass Quintet & Organ, if you insist!) becoming a frequent and welcome ensemble in concert series throughout North America.